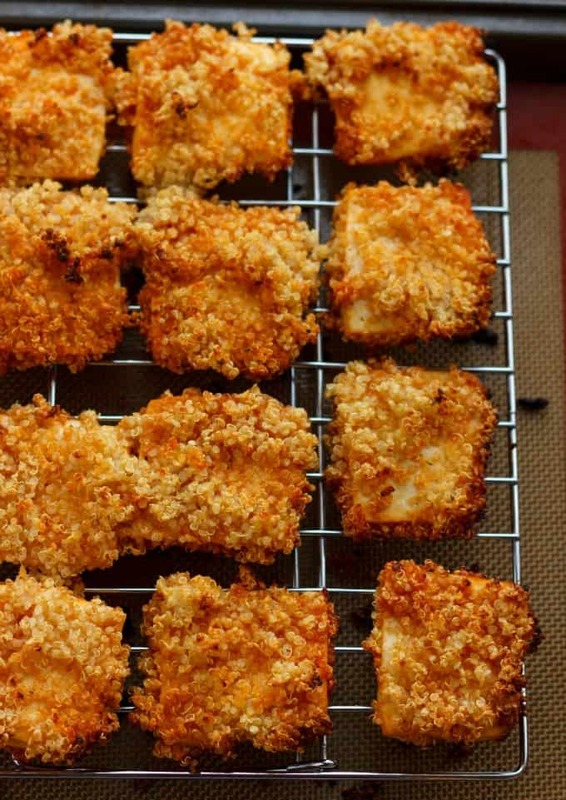 Let’s celebrate everything healthy with these quinoa crusted tofu nuggets (or tofu “chicken” nuggets as I like to call them!) What a great way to start off Tofu Week here at The Cookie Writer! I love tofu. Even if I was not a vegetarian I would have no issues eating this protein. I actually started experimenting with tofu at a young age while I still lived at home. My dad would often make a huge meat chili, and while I loved chili, I was not the craziest meat-eater. I decided to make my own batch alongside my dad and added tofu. Now, of course at the time I did not realize there was a difference between all the different tofu out there, but I have learned. I worked with silken tofu which basically fell apart in my chili. Still delicious, but not the texture I wanted at all. For most recipes you will find yourself working with firm or extra firm, like I did here with these quinoa crusted tofu nuggets. Extra firm would be best, but I got away with using firm tofu. Now, tofu holds A LOT of water. A lot. So you want to do something about that because it will inhibit your tofu from nicely browning/absorbing those wonderful flavours. I tend to wrap my tofu in paper towel and set heavy objects on top to push out the water. You may have to do it a couple of times, but trust me, so worth it. My favourite tool is my cast iron pan. Once that prep is out of the way, working with tofu is a breeze! Any THICK sauce shall do, but I went with BBQ sauce. Yes, I realize the sugar content can be high, but it is all I had. You can make your own sauce or coat the tofu in your favourite variety. Just remember, thick is key because otherwise the quinoa will have a hard time sticking. 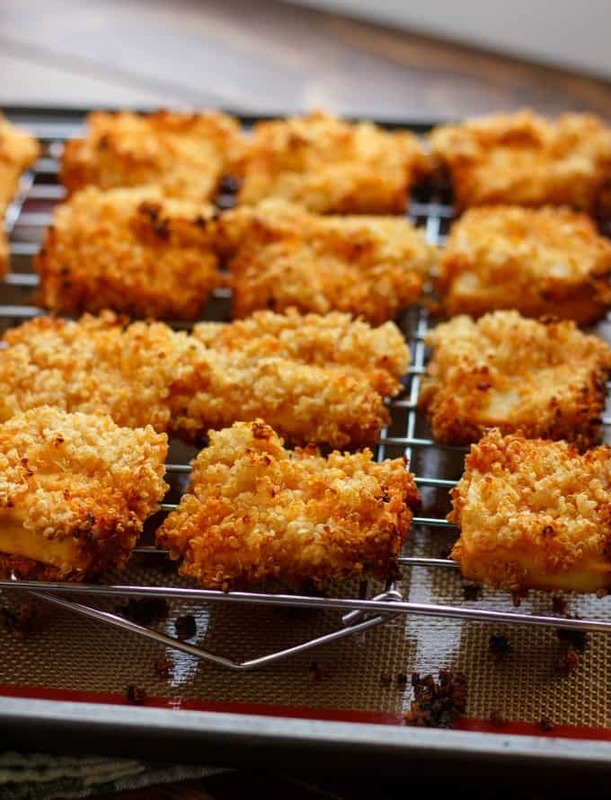 Slice tofu into little "nuggets." I suggest 1/4 inch thickness if you are not familiar with tofu. Dip into BBQ sauce (generously) and then coat with cooked quinoa (it can get messy: I kind of placed some extra on top when I brought the tofu pieces out of the quinoa.) Place onto wired rack. Continue until none remain. Cook for 15-20 minutes, or until quinoa is browned and crispy. Serve alongside more sauce if desired! Bam! Recipe one of Tofu Week complete! 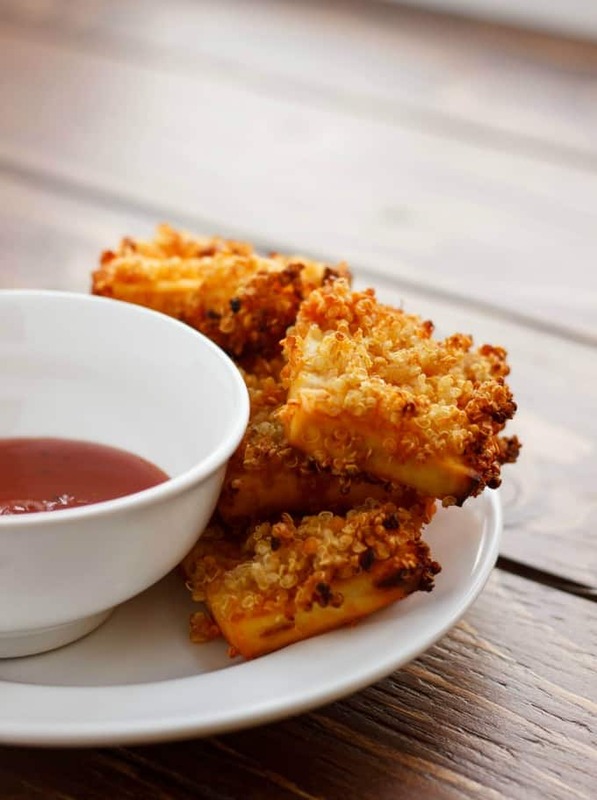 If you thought these quinoa crusted tofu nuggets were neat, stay tuned for some more awesome recipes! My daughter loves tofu. I wonder if she would enjoy tofu nuggets. I know I would and they would be perfect for a nutritious lunch today. I was just talking about needing more (and better) tofu recipes with friends over brunch this weekend! I love quinoa and will have to try this. Looking forward to more Tofu Week recipes! These are genius, so into these!!! Haha, no worries, it took me some time to realize, too! Can you believe I've never tried tofu? It's never looked or sounded appealing to me. That has all changed now because of your nuggets. I'm going to give this recipe a try. Thank you! I think my kids might actually go for these. Can't wait to try it! Love, love, love this recipe! I enjoy tofu, but sometimes I need something a little different...this is it! Genius with the quinoa!! These nuggets look beyond perfect! So crispy and totally delicious. I want to dip dip dip with these little nuggets. What a cleaver idea! I am totally sharing this with my vegetarian friends! Wow! These look delicious, and I am totally a meat eater, lol. ;) I love that quinoa crust! Haha oh goodness! I am surprised your husband likes tofu! I love the idea of using quinoa! I would have never thought that this is tofu! I love how there is quinoa on them! Oh my god. IT looks so YUMMY. we will try to make it tonight. My family love it. Such an awesome idea! Thanks so much! This looks so good! I can't wait to try it! Hmmm, you do want a thicker sauce so the quinoa will stick. Do you have any favourites? I've made my own BBQ sauce and that really makes a difference! My husband I also like picking random sauces off the grocery shelves so you may have some luck if you do that. I have worked with Pulo Cuisine before and they make really nice sauces (I think they are all vegan, too!) Sorry I am not of more help. Me and my mom both made this recipe and it turned out amazing!!!! Thank you for sharing. Just made this spontanously. To save time I just used popped Amaranth. I did half of them with ketchup and half of them with sweet chili sauce as binding liquid. I'm wondering if the re pie should say 1/2 c uncooked quinoa (which would be 1 c cooked)? I used 1/2 c cooked and that only covered 1/2 my tofu so I had to make more midway through the recipe. I'm wondering if it had to do with the amount of quinoa on your tofu. My BBQ sauce is a bit on the thinner side so I found I did not have copious amounts on my nuggets. I'll definitely keep an eye on the quantity when I visit the recipe again. Thanks for the heads up! Wow! These turned out awesome! I wish I could attach a picture. Make sure to dry your tofu thoroughly. Crispy and tasty and filling! Yes!! It is a bit of a pain, but drying out your tofu is essential! So i have quinoa flakes, just wondering if that's what you used and how you actually cooked it? The box has no instructions and I'm all new to this... I'll have made the recipe before you reply so I'll let you know how it turns out without cooking the quinoa! Hi, Max! I used regular quinoa (the whole-grain variety that cooks like rice.) I have never used quinoa flakes before, but if you do happen to try them out, let me know how it goes! Quinoa flakes appear more like oats/oatmeal. These were okay, a little bland -- I might try them again with marinated tofu or spiced quinoa. One of my two kids liked them. Hi. I’m interested in doing these for my daughter. Have you tried freezing them? I’m not familiar with tofu so I have no idea. Thank you! Can this be baked ahead of time? Will it be crispy still?